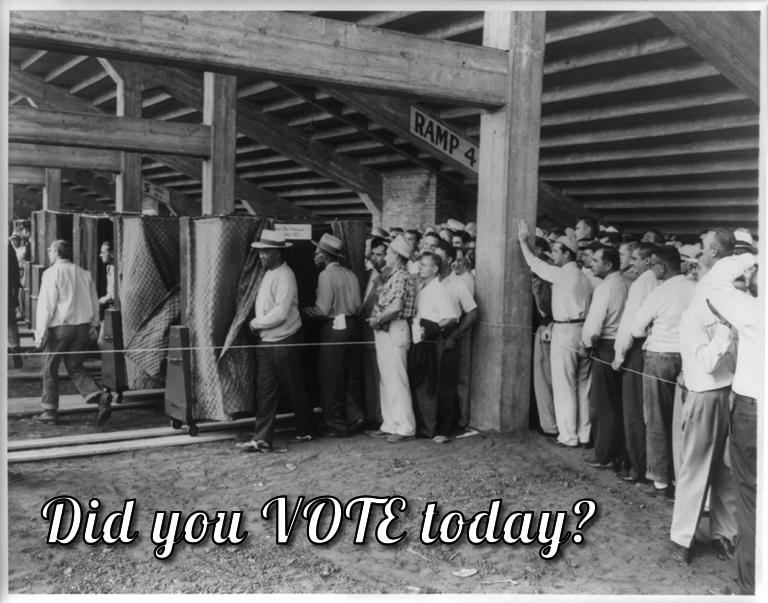 Studebaker workers voting under the bleachers of a stadium in South Bend, IN circa 1950-1960. I’m a sucker for performing important civic duties…..and black and white photography. So I decided to craft this impromptu voting poster today with the help of the United States Library of Congress and their awesome digital collection. While I really don’t have much to say this morning beyond the trite “go, vote” mantra that even the least engaged citizen can accomplish, I wanted to point out that the LoC has a fantastic collection of images, legislation, websites, audio, video, and more! If you happen to be in the patriotic mood, go help yourself to one of their “voting images” from the photo, print, and drawing category (most of them are public domain, or available under free use exemption), load it up in an image editor of choice, and have your students create some propaganda for the simplest civic duty any of us can perform. I particularly enjoyed shifting through the LoC archives for a few minutes, to see see examples of political advertisements and images from a wide range of U.S. history, including the image above, which was taken not too far from where I live, about 30 minutes away in South Bend, IN. It’s a simple way to knock out a few technology standards in the K-12 arena, a brief exploration of historical imagery related to Civics standards, or a simple ds106 Visual Assignment in a pinch. Don’t live in the U.S. or want to explore other historical media from other nations? Check out the list below!